VMRO-DPMNE today revealed that the scandal plagued SDSM member of Parliament Mira Stojcevska hired not only her son, but also her brother in the state run ELEM energy company. Stojcevska yesterday denied knowing that her son Viktor ever applied for the coveted post in ELEM, and that she didn’t influence the outcome of the candidate evaluation in the company. But today VMRO spokesman Dimitar Arsovski revealed that her brother Cele Velevski was also hired at the REK Bitola power plant managed by ELEM. Asked by the A1on news site, Stojcevska again pleaded ignorance. “He’s a family man, I really don’t know if he works there, I tried calling him but he didn’t pick up”. It’s curious how so many close relatives of Government officials are being employed in the public sector, in companies and institutions which pay far above the 500 EUR wage which Zaev promised would be the average wage for the entire country. Maybe this is part of the SDSM plan to increase the average wage – getting all their relatives hired in companies which hand out high salaries, Arsovski said. The member of Parliament earned the nickname “Mira Diesel” after it was revealed that she cashed in a whopping 12.000 EUR for a year to attend Parliament sessions after she claimed she still lives in her home town of Delcevo. The public was further enraged when it turned out that Stojcevska nand several members of her family, living in the same house, also received municipal heating subsidies independently, as if living in separate homes. According to Arsovski, her brother was hired through a temporary employment agency, a move which allows public sector companies to avoid the rules put in place to limit hiring and avoid increasing patronage and nepotism. Arsovski also asked Stojcevska to respond whether it is true that both her son and her brother were hired after the presidential elections were called, which is another violation of rules against political interference in the public sector. 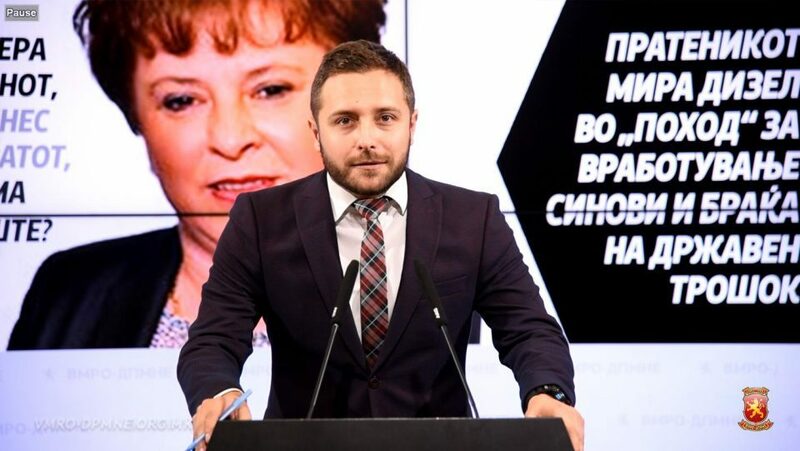 The opposition VMRO-DPMNE party revealed that Stojcevska’s son was hired as part of a wide push to have children and relatives of top Government officials employed at public institutions or publicly managed companies. SDSM Minister Damjan Mancevski, who is in charge of public administration reforms, defended the practice as a form of “payback”.